Lucy is now 3 days old and healthy and we managed to have the positive, natural birth that we planned for! It was amazing! After the Thursday morning assessment in which a new obstetrician was, unfortunately, pressuring me into a caesarean again (because of the high head and extra fluid and his past bad experiences with cord prolapse) I got to the point where I was at a loss for words having repeated the same BRAIN technique questions over and over and not being satisfied that all roads pointed to a caesarean. Because my husband and I had prepared for this he jumped in and said we'd like a second opinion. I was starting to feel like every doctor would have the same opinion when a younger doctor said to me it's really good that I'm asking questions and self-advocating because obstetricians are risk averse due to the litigious nature of society and zero tolerance for unhealthy baby and mum outcomes. I said that's not a good enough reason for me to hand over/ not be apart of the decision-making process. The final and third consulting obstetrician started by asking me what's my story rather than telling me I'd need a caesarean straight away. I burst into tears and the amazing midwife and my husband filled her in. She then examined me and said there's no reason for an imminent caesarean, my body still has time to do this naturally. A reassessment wouldn't be needed for 5 days but I needed to stay on the ward so if my waters broke I could be monitored ASAP for cord prolapse. I said thank you for listening to me. My waters broke midnight that night! There was no prolapsed cord, my babies heart rate was healthy. The midwives monitored me closely, unobtrusively and respectfully. I visualised my surges guiding my babies head down into my pelvis. Within an hour it was engaged enough that I could get up and flop over the bed. Within 2 hours I started to shake and remembered this meant I was going into transition. I focused on relaxing and opening up and when I felt I "needed to poo" I breathed my baby down so effectively and efficiently I surprised myself- all that practice on the loo paid off! A 3-hour birth. A beautiful healthy girl! I found that I used every aspect of your course from being informed, fighting to feel empowered with decisions regarding my birthing, keeping anxiety at bay, positively visualising my body and baby knew what to do and using my birthing toolkit with breathing techniques to have a calm, easy birth. I wanted to share my (long-winded) story with you- especially the outcome so that I could express to you how much of a difference you and hypnobubs have made to me as a mum and my newborn daughter. She will know the story of her birth and carry the legacy of a long line of birthing women. 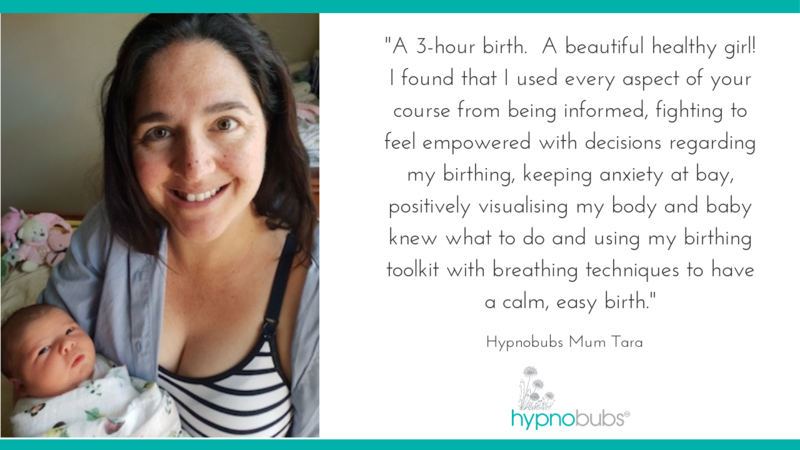 To find out more about our Hypnobubs® Hypnobirthing Online Course options for natural birth - click here. 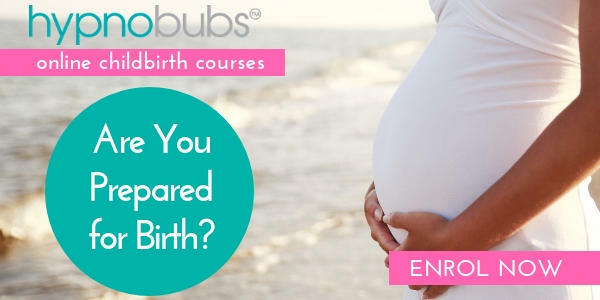 To find out more about our Hypnobubs® Hypnobirthing Online Course for cesarean birth - click here.